There must be some logical reason these athletes are turning to cannabis during their training, right? After all, what serious athlete would jeopardize their performance for a quick high? Turns out, in the right dose (and that’s an extremely important part) there are positive impacts on exercise. “There’s a bronchodilatory effect, [which creates] better oxygen delivery, potential pain-numbing effects and the possibility for creativity and focus, which is why some UFC fighters and ultramarathoners might use [cannabis],” says Ben Greenfield, former Ironman triathlete and current CEO of Kion, a coaching and consulting company for high-achieving clients who often use cannabis and hemp extract to aid in recovery. So what’s going on here? Let’s get ready for a science lesson! 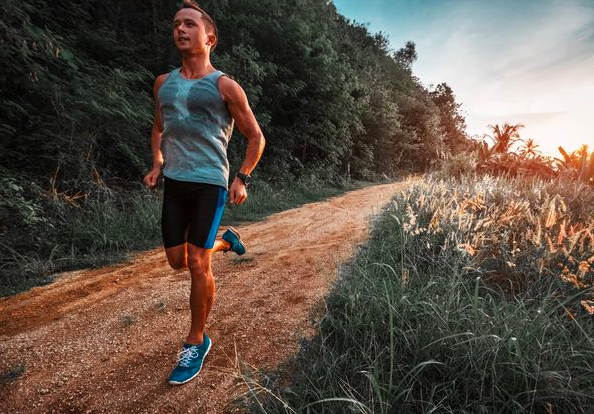 Cannabis — particularly cannabidiol (CBD), a nonpsychoactive chemical compound found in cannabis — can be an effective analgesic, helping reduce pain both during and after exercise. “It’s really across the board in all different types of pain, whether it’s musculoskeletal, inflammatory, neuropathic and so forth,” says Dustin Sulak, integrative medicine physician and founder and medical director of Healer.com, an online resource for medical cannabis patients. Cannabis affects pain via two major pain-signaling pathways. The first is the descending pain inhibitory pathway, which is the brain’s way of telling the rest of the body to stop sending pain signals. “Cannabis really augments that pathway,” Sulak says. The second is the ascending pain inhibitory pathway, which prevents pain signals from being sent in the first place. It’s important to realize that our bodies produce endocannabinoids — our version of tetrahydrocannabinol (THC), or the psychoactive chemical compound in cannabis primarily responsible for the euphoric “high” — to help repair injured or inflamed tissue. When you get injured, your body’s endocannabinoids begin working to prevent signals from your pain nerves (also called nociceptors) from reaching your brain. “So we have [cannabinoids] working centrally on the descending pain system, and we have them working in the peripheral tissues and the peripheral nerves to prevent that signaling coming up in the first place,” Sulak says. And just as cannabis can decrease pain, CBD salve can also help speed recovery following a workout or race. This is a great benefit for endurance athletes, who typically don’t have a lot of downtime in between practice sessions. “Plant cannabinoids can work right along with our inherent healing system to promote better recovery,” Sulak says. If you’re active, chances are you’ve experienced — or at least heard of — the “runner’s high” phenomenon. Well, cannabis may help runners feel this sensation more easily. Those who experience the sensation of runner’s high describe it as a moment of greater focus and clarity. And though a runner’s high is often attributed to endorphins (hormones secreted by the brain and nervous system that create a pain-numbing effect), it’s really caused by endocannabinoids, as shown by a 2015 study published by the Proceedings of the National Academy of Sciences. In other words, runner’s high is caused by our bodies’ own version of cannabis. “All of these things cannabis can do for athletes, athletes are already doing for themselves using components of their inner pharmacy,” Sulak says. But these athletes aren’t smoking pot like your typical stoners. Sulak says endurance athletes typically use drops or sprays that are administered directly to the mouth. The THC gets absorbed through the blood vessels in the mouth, which means it kicks in pretty quickly (between 15 and 30 minutes). Drops and sprays also work at an intermediate duration, roughly four to six hours, whereas inhalation would last two or three hours. According to Sulak, cannabis primarily enhances the runner’s high effect by altering an athletes’ perception of time. That’s mostly thanks to the THC. It helps people become less preoccupied with the past and potential future and more present in the moment. The result: greater focus and reduced anxiety. In spite of its potential benefits, cannabis use does come with inherent risk. Because dosage is highly variable from one person to the next, it’s not a self-medication situation, and it’s imperative that each individual work to find the dosage that’s right for him or her. In the wrong dosage, cannabis can alter the perception of risk, impair coordination and movement and confuse time estimation, thereby increasing the odds of accidents and injuries, according to a 2011 review in Sports Medicine. Cannabis use, even if infrequent, can also lead to slower reaction times, sedative behavior and trouble remembering things, according to another 2006 review in British Journal of Sports Medicine. And when used long-term, cannabis may lead to a drop in cortisol (also known as the “stress hormone”) and testosterone, which has negative implications for athletes. “Both of those hormones are really needed to be able to crush a workout,” Greenfield says. In addition, cannabis use may inhibit the secretion of human growth hormone, which aids in building muscle, according to a 2002 study in the Journal of Clinical Pharmacology. Cannabis is still illegal in the United States as a whole as well as in the majority of individual states. Those interested in using medical cannabis to enhance athletic performance should first consult the laws and regulations in their area. Even in states where cannabis is legal, it is recommended that people seek advice from a medical professional to determine proper dosage.